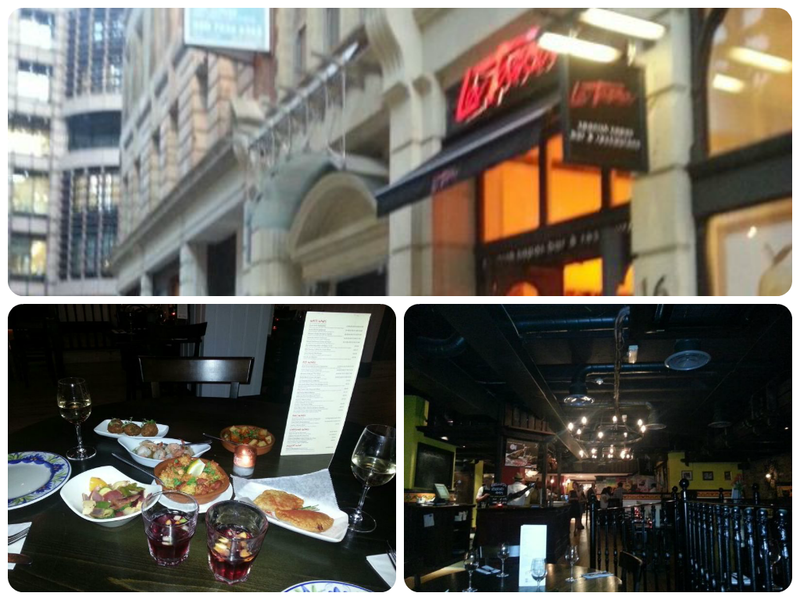 I went to the opening of the new La Tasca Broadgate with my friend Danielle. This was a really handy location for us as we both work in the City and the restaurant is right next to Liverpool Street station. I can’t remember the exact Spanish names of these dishes! My friend who was dining with me is a fan of Spanish food as she has spent time living in Madrid and Seville. She was keen to order some croquetas as they are her favourite. They have a fair amount of variety on the menu, with a few different versions of some of the classic tapas. For example you can get croquetas in different flavours ranging from meaty to vegetarian and the same applies to the paellas. Personally my favourite of these was the empanada which is basically like a Spanish meat pasty! I liked the prawns too and we both thought the sauce on the papatas bravas was quite authentic tasting. As well as eating the food we were able to see a brief demonstration of how to cook paella. They made a seafood one with prawns, squid, white fish. This was explained by the person in charge of sourcing all the ingredients and he told us about the best prawns which he likes to get from Argentina which are the freshest and tastiest all year around. They did make it look quite simple to make paella so we will try to recreate it at home at some point! Just to make the meal even better we were also given a free glass of sangria each – definitely a nice treat after a long day at work. To find out more about La Tasca, Have a look at their website, like them on Facebook, or follow on Twitter. Thanks to my sister for her guest post, and I hope I do make it to La Tasca one day myself to try out the food. I have not got much experience with Spanish food but it sounds great!